A 1959 Nash Metropolitan has been restored as a collective project by the Delta College Automotive departments. Delta’s involvement comes after Auto Body Professor Larry Mariani was approached by the Board of Trustees at the Haggin Museum to participate in the restoration. 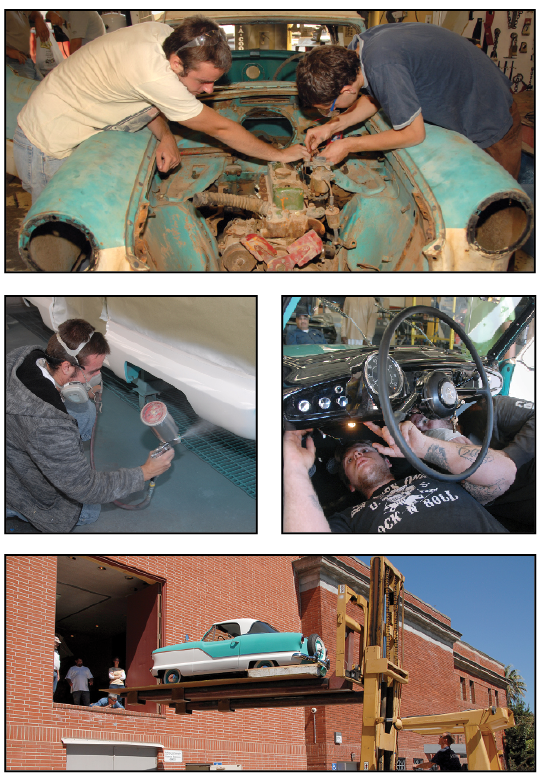 The now-restored car will be part of the museum’s “Driven to Dream” exhibition will run from Oct. 3 through Jan. 5, 2014. “The Nash, in entirety, was student based, instructors shouldn’t take the credit, it was the students,” said Mariani. Advanced auto students were selected by various professors in the auto departments to participate. The project took a year to finish. In the Auto Body department there were various groups of students who started the car, and moved on to graduation. Cody Rose and Seth Gruebele, both current Delta students, saw the project from beginning to end. “I think it was fun learning everything, seeing it all rusty and old to the way it is now,” said Rose. The vintage vehicle was the most in-depth project Mariani has seen the students take on. “This is all about the students get a sense of persistence, how long it takes for a full restoration, but once they see the end product and the light at the end of the tunnel they think:‘Hey, I can do this,’” said Mariani. There were hurdles Mariani and the students faced along the way, but the car went from diamond in the rough to a gem. “What happened was everything that could go wrong went wrong, so it was a lot of set-backs,” said Gruebele. The bodywork done by the students include: priming, block sanding, main paint, bodywork and buffing among other tasks. Other auto body departments handled electric and automotive tasks. Gruebele and Rose both plan on either owning their own shop or getting a job in the auto body department somewhere down the line. “I felt pretty accomplished I stayed through the whole process,” said Gruebele. Mariani said he hopes to get all the auto departments together for another possible project, perhaps an eco-friendly car. If the departments agree, it would be totally electric, run on solar power and painted with water-paint. “It’s good to intermingle auto students with different disciplines,” said Mariani. The Nash will remain on display at the Haggin Museum until its raffle on Dec. 19. Raffle tickets are $25 each. Five can be purchased for $100. Tickets are available at the museum, located at 1201 N. Pershing Ave. in Stockton.